Caldo stuck in the tree outside Yutle’s bedroom. This is a story I started about ten years ago. I thought it was lost, but I found a copy of it on an old computer the other day. It’s a bizarre story filled with comedic science fiction and is a lot of fun to write. Yutle was reading a comic book in his room. Although it was a bright summer’s day outside, the curtains were drawn tightly across the window, the patterned cloth glowing angrily in the sun. Yutle was reading by the light of his desk lamp as it was just too much trouble to get out of bed and open the window. The comic book had started out very good. Earth was being attacked by an advanced race of alien creatures. At first it looked like the aliens would win, with their lasers and silent hovering ships, but Yutle was fairly sure the humans would save themselves through some disappointingly predictable plot twist. The aliens would turn out to be allergic to wood splinters or something. Somewhere off in the distance a siren let out a melancholy wail. Without taking his eyes off the page Yutle reached over the side of his bed and pulled a buckle across his back, attaching it to a clip on the far side. The whole house started to shake. The book in front of Yutle slowly lifted off the pillow, followed a moment later by the pillow itself. Yutle slammed his hand down on the book, pinning it and the pillow to the bed. Everything in the room was now rising into the air. Yutle’s blanket, a football, papers, cassettes and various articles of clothing all stuck to the ceiling, bunching together near the north wall. Slowly the pile jostled its way across the ceiling to the opposite wall and then slowly settled back to the floor in a confused heap. A lone sock hung forlornly from the ceiling light. Yutle unbuckled himself and kept on reading. The aliens did have a crippling weakness after all which the humans handily exploited, thus ensuring their continued survival. Yutle sighed and closed the book feeling slightly disappointed. He glanced over at the contents of his room piled against the far wall, sighed again and opened the comic book to the first page. The upside down boy struggled with the branches for a moment, then gave up, panting. The boy was struggling with the branches again. The boy gave Yutle an ugly look. The look would have been more effective without the leaves and twigs that stuck out of his dirty blond hair. Being right-side up would have helped too. The boy’s smile turned to a frown, “Just forget it okay? I’ll get myself out!” He began trying to free himself again. “You’ll never get out that way,” Yutle commented after watching the boy struggle for a few minutes. The boy grunted and shot Yutle a terrible look. “Fine,” said Yutle and he ducked back inside his room, shut the window and closed the curtains. He retrieved the comic book from under his bed where it had fallen and lay back down. 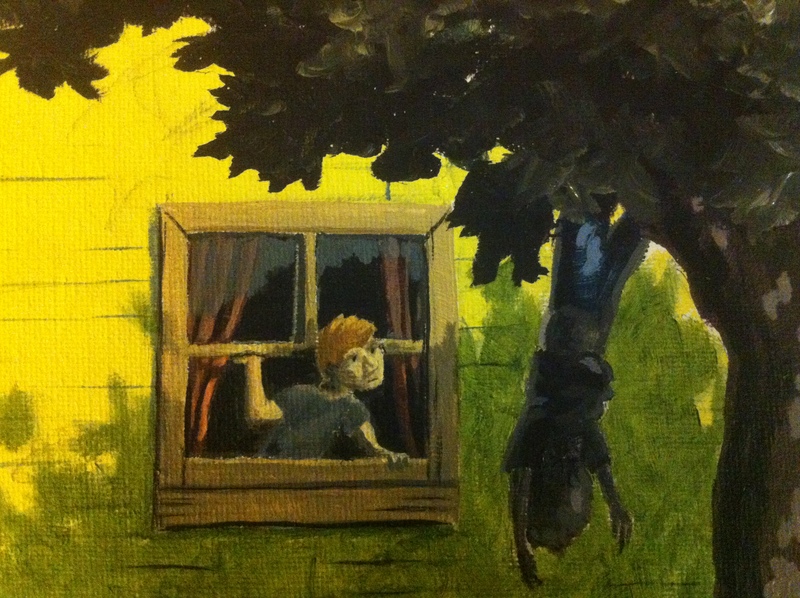 Outside he could still hear the sound of breaking branches and words he was pretty sure the boy in the tree shouldn’t know. Finally there was a tremendous crash and more colorful words from the lawn. Then silence. Yutle smiled and kept on reading. The aliens had just attacked a military base. It was very exciting. Then Yutle heard the screen door downstairs open and close with a bang. He frowned and got out of bed. He could hear footsteps as someone walked around the kitchen below him. He frowned again and made his way to the staircase and down to the main floor. The boy from the tree was going through their refrigerator. He still had leaves in his hair and the leg of his jeans was badly torn. The boy thought about this for a minute, then took a bite out of the apple he was holding. “Where are they?” he asked finally. “Yeah, that’s weird.” said the boy. “What’s your name?” asked Yutle. “I’m Caldo.” The boy smiled. “I’m Yutle,” said Yutle, deciding that maybe he liked this boy after all. “I’m not sure how I’m going to get home…” said the boy, the smile fading from his face.